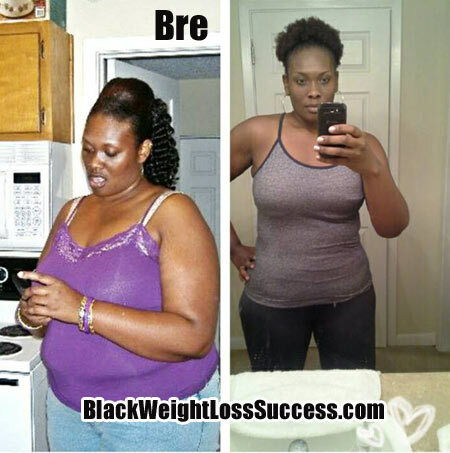 Our featured weight loss story of the day: Bre lost 45 pounds this year. However, she wrote us to share a timeline of her whole weight loss journey. It’s a reminder that weight loss takes time and that change doesn’t happen overnight. Check it out. Lets run down the last 5 years quickly. – In 2007, I had a stressful job and though I was having a heart attack. – In 2009, I l ost my job and didn’t recover at all due to the recession. – From 2010 to 2012, I had went from a 26 to a 22 but was stuck there weight wise. – In 2013, I just got pissed off. Seriously, everything was piling on me. Stress + Weight = disaster. So, here is what happened to set me free. I watched a YouTube documentary with my husband who is a diabetic called “Simply Raw” about a group of diabetics going raw for 30 Days. It talked about clean eating all the way on a raw vegan diet (aka. being a raw foodist). Then, the next month, Black Women Losing Weight did the monthly challenge of Vegan/Vegetarian eating. That was right up my ally. So, I threw myself in nothing but fruits, veggies, lean meat (fish or chicken) and water/ 100 juices for the first 2 weeks. Then no meat or juice just water for 4 weeks. I went over the challenge time line. I was amazed to see 20 pounds gone in a month. I wanted more but decided to add protein back (clean fish no catfish, crabs, shrimp, etc and chicken). No short cuts. I dont eat BS until my cheat day which is between the 15-18 of the month. On day I have a ice cream cone or a 25 cent bag of chips. Thats it. My start weight in May 2013 was like 275 pounds. I am now 230 pounds. My heaviest weight, without pregnancy was 340 pounds. I do the Beachbody Challege, which is better known for Insanity, P90X etc. I fell in love with another program, Les Mills Combat. It’s High Interval Training which burns fat and calories as well as adds weight for muscle tone and build. I routinely do this while running 10 miles a week. i just chose any day and say “Ok, do I have my 10?” I look at MapRun, which is a free app with Android and go running. I usually do this about 3 miles, 3 times a week. Eating routine: Fruits , veggies, lean clean meats (selective – no bottom feeders *catfish, shrimp, etc*, fish and chicken), Water (add lemon, mint, fruit), 100% juices. One cheat day a month..mine is usually on the 18th. Photos: Before photo is from 2009 and the after photo is from 2013. Wonderful testimony, that’s an awesome testament of what clean eating can do. Thanks for sharing! i have lost 22 pound in one month walking and zumba and water has really helped and i meal a day..
I’ve seen that documentary you referred to and it is truly very motivating. I rewatch it every couple of months as a reminder and have shared it with friends. Grrrreat job! U look fabulous. U definitely woke me up again. Weight lose is a huge struggle for black women. I believe we just don’t know where to start and end. Your story is a good starting place. Thanks for sharing. God blessing. U made my day,..thanks for sharing! Wonderful story and you look GREAT! I will definitely be looking into “really” cleaning up my eating. Thanks for being an inspiration.